With even the slightest amount of discretionary spending, you can build a bedget-friendly leisure lounge. Here's how. Starting at $2,000, these examples give you an idea of what it takes to get the ball rolling on your in-home gameroom. THEY SAY death and booze are the only two industries truly recession-proof, but can you imagine anyone drinking or dying without at least a semi-respectable gameroom set up in their house? Unthinkable! Just because the value of your 401-k is dropping faster than Jim Cramer's ratings post his Daily Show appearance doesn't mean you have to do without the gameroom you've always wanted. Retailers are hit by the economy, too, and they still want to move product. There are plenty of options for shoppers on a budget. Your local billiard retailers can help guide you in the right direction. Depending on the size of your space, your desired decor and overall budget, you can get pretty much anything you want, from a utilitarian, no-frills poolroom to a whole gaming, lounging and entertainment center - all for anywhere between $2,000 on up past $7,000. "The trend we're seeing," says Jim Graven, owner of C.C. Steepleton Co. in Louisville, Ky., "is middle-of-the-road pricing. It doesn't matter if it's the table, the lighting, air hockey, wall decorations, everything they'll take the medium priced one. "That tells me no one wants to sacrifice much in the way of quality, but they're still mindful about saving their money. They want more for their buck. Three years ago, people were mad at their money. They couldn't wait to give it away. They wanted everything shiny and new with bells and whistles. Now, they're more cautious." Until we start to see a light at the end of the Recession Tunnel, cautious ain't a bad way to go. 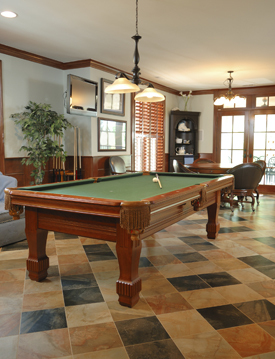 But while you're riding out the tough times, why not rack up a few games of pool, maybe play some poker or foosball and enjoy the serenity and good times of your own home gameroom? Let's break it down into four budget categories: starting at $2,000, $3,000, $5,000 and $6,500. Odds are likely that if you're realistically ready to put together a gameroom, you fall into one or more of those categories. Keep in mind that similar products sometimes sell for much different prices depending on what part of the country you're purchasing it in, as well as the demand for that product in that location.